CRG Hamadryad Park clean-up boosted by 7 new recruits! 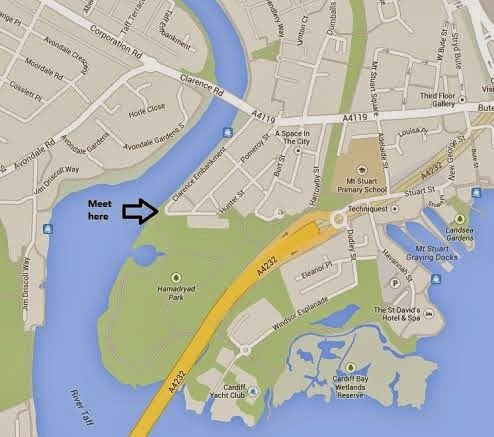 On Saturday, 20 volunteers from Cardiff Rivers Group litter-picked Hamadryad Park in Cardiff Bay. Despite the blustery conditions, the volunteers worked for 2 hours to remove 62 bags of rubbish from the park and banks along the waters edge. Their numbers were boosted today by the welcome addition of 7 new recruits! These new volunteers came from various parts of Cardiff to lend a hand and were a great help. More photos from today’s event can be seen on our Flickr page here. Cardiff Rivers Group are supported by Keep Wales Tidy and the Tidy Towns initiative that is funded by Welsh Government. If you would like to get involved, please contact Louise Tambini. All rubbish collected was disposed of by Cardiff Council Park services. As river levels are still high, we will return to the safer shores of Hamadryad Park on Saturday 22nd March for some unfinished business. At the end of our last clean-up at this site we found a hot spot in the reeds under the flyover which was thick with litter. This time we are ready for it! We are hoping to attract a large group of volunteers as we know there is a lot to do. Rendezvous at the Purple truck at the Clarence Embankment entrance to the park. For those unfamiliar with the area, see map below. As usual, all tools and equipment will be provided. Please wear warm, waterproof clothing in case the weather is poor. 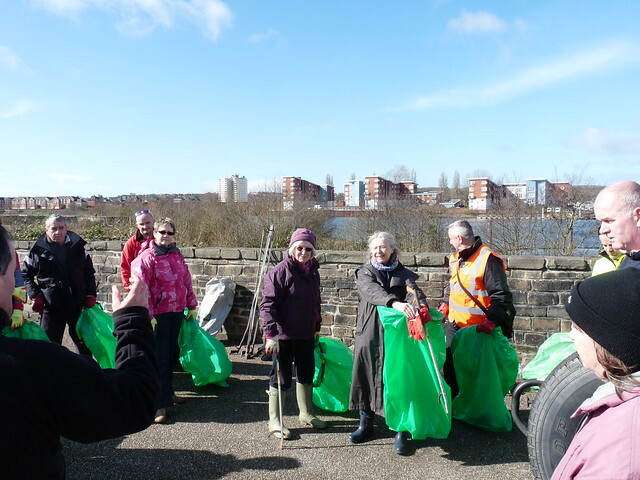 On a sunny, spring, St David’s day, the Cardiff Rivers Group returned to Pentwyn lake and surrounding area for a clean-up at the request of Cardiff Parks Services who had received several complaints that this local beauty spot was in need of attention. 22 volunteers, including four from Llanederyn Police station grafted for over 2 hours removing rubbish and a whole host of items from the Pentwyn lake area and clearing a severely dammed area by the skate park. As well as collecting 36 bags of rubbish, the haul included 5 trolleys, 2 traffic cones, a wendy house roof, a playground sit-on duck, car/motorbike/cycle tyres, road signs, a car battery, a scooter, a kiddies cycle, a bench, a school chair, a wooden cabinet and a number of carpets. Treasure was found in the stream at the bottom of Hollybush Road in the shape of a silver ornament which has been taken to the Police station, hopefully to be re-united with its owner. PC Rhys Cadwallader commented “We had a very enjoyable time contributing to the project as we frequently patrol the area and it was very rewarding being able to assist with the clean up as witnessing the amount of rubbish in the area on a day to day basis can be disheartening. From the moment we got into the lake to clean it up, we were astonished by the amount of children and adults who started to show an interest in what we were doing. The Lake and the surrounding parks are a beautiful place for the community to spend their time and it is a shame that people have littered it to such an extent. With the help of the Cardiff Rivers group we all worked together effectively and the lake was cleared within a short time. Following the cleaning of the lake we then moved on to the rivers and surrounding wooded areas. The teams removed a great amount of rubbish from these areas. At the end of the day I think everyone who was there including members of the public were absolutely amazed by the 3 truckloads of tyres, trolleys, bikes and so on. I feel that everyone who attended today and took part should be proud of themselves as they have bettered the quality of life for the community and not to mention the wildlife!”. As well as all the volunteers that turned up, the CRG would also like to thank PC Cadwallader, PCSO Dai Coles, Ray Lawson and Jordan Rees from Llanederyn Police station for their contribution to the clean-up operation and a big thank you to Cardiff Parks Services for disposing of the rubbish on the day. Hopefully, the local residents and community will notice the difference and get more enjoyment from this local beauty spot. You can see more photos of the event on our Flickr page, here. 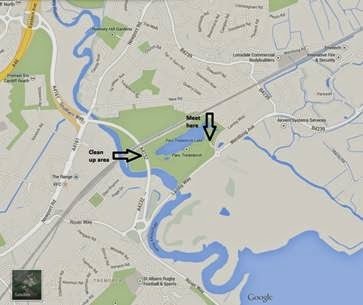 By special request from Cardiff Parks Services, the next Cardiff Rivers Group event is on Saturday, 1st of March cleaning up Pentwyn lake and the surrounding area. We did this area at a special CRG event where we partnered a BT volunteering day back in July ’13 and now they need us again. We will work around and in the lake and also stream. There is a particularly bad area by the play park where at least 4 deeply rooted trollies form a bit of a dammed area. We are hoping that the event attracts a large group of volunteers. There will be a groups of people working in the stream and lake wearing waders as well a larger supporting group cleaning up the along banks and nearby paths. We will rendezvous at the Purple truck shown on the map at the car park area nearest the play park and lake. For those unfamiliar with the area, see the map below which shows the car park and meeting place. Please wear warm, waterproof clothing in case the weather is poor. Please let me know if you can make it so we can gauge the numbers. Come with us this Saturday and spend a few hours of your St David’s day making a difference!